The news that the Swedish owner of potential America’s Cup challenger Artemis Racing recently visited his team’s base in Almeda, San Francisco for the first time since its summer 2012 opening, reminds us of a tongue-in-cheek spoof interview by The Yachting World magazine’s Clyde correspondent, John Fearon, on the run up to Sir Thomas Lipton’s 1901 America’s Cup challenge with the G.L. Watson designed Shamrock II. Outside the palatial residence in which Sir Thomas Lipton spends the few spare minutes left to him after the discharge of his multifarious duties, I walked into the first ambuscade. The miscreants had apparently lain in concealment by the park gates, and so expert were they, that before I was well aware of their presence I found it equally impossible to advance or retreat. Most of them had pencils and notebooks, and they talked together with a nasal accent, which had apparently been cultivated on ice water and chowder. It seemed to me that the instruction might have been given with a little more regard for my feelings, but I was relieved to find that all that George intended to take was the details of my experiences. In a few minutes I had laid bare the most sacred details of my life, while the other villain danced round with a Kodak clicking 45 times to the minute. Then they passed me on with an intimation that they were “from the Screamer,” and a final threat to send me a copy. There were others in waiting to carry on the horrible work, and before I reached Sir Thomas’s hospitable door, I had yielded upon my most treasured recollections for the entertainment of the unwashed readers of half a hundred American papers. Under the circumstances I was not surprised to find Sir Thomas girded in a kilt, and hacking furiously at an imaginary foe. The sword exercise seemed to me an admirable precaution for a man who had to run such a gauntlet every time he passed his own doorstep. When he suspended the practice, however, I took the opportunity of hinting my opinion that the disguise did not leave sufficient to the imagination. The secretary thought so, but would not commit himself to an opinion until he had consulted his books. “You are quite right,” said Sir Thomas, after the consultation, and apparently lost in admiration of my intimate knowledge of his private affairs. I find that I have challenged, and the races will be run in August. 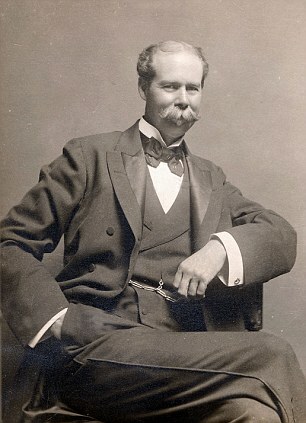 Mr. Watson of Glasgow is designing the boat, and will, I am sure, be only too pleased to give you all particulars. From, ‘The “America” Cup, Some Imaginary Interviews by John Fearon’ in The Yachting World Christmas and Mediterranean Number, December 1900. 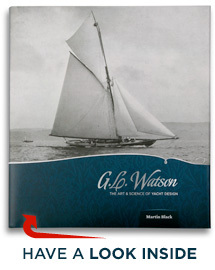 Martin Black’s biography of America’s Cup designer G.L. Watson contains countless similar gems. Buy it here. This entry was posted in America's Cup, G.L. Watson, G.L. Watson clients, Glasgow, Irish yachting, journalists, yacht racing and tagged Artemis Racing, John Fearon, San Francisco, Shamrock II, Sir Thomas Lipton. Bookmark the permalink. John Fearon was my grandfather although I never met him – he died in 1937 and I was born in 1943. This suggests that there are some more of his articles – is that so? Hi Colin, Yes indeed I am in contact with another member of your family who is now based in Spain. Let me contact him and get his permission to pass on his details to you. As well as the satirical pieces that Iain refers to, John Fearon wrote a series of articles on the story of early yachting. The series was entitled “Reminiscences” and was published in Yachting World between October 1903 and November 1908. I hope that that helps. I also have published a photo in my book showing the Clyde Yachting reporters, which includes Fearon.